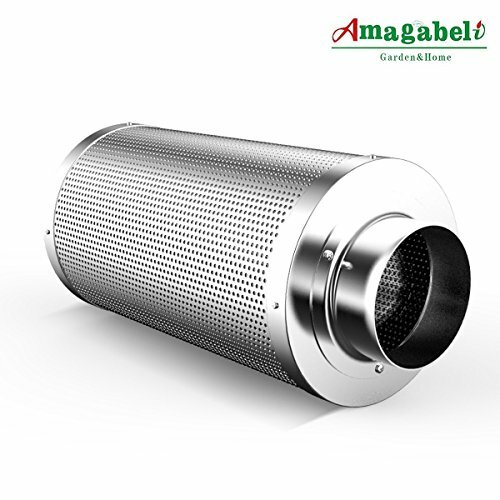 Exceptional Odor Control: Amagabeli 190 CFM Air Flow Carbon Fliter can effectively eliminate odors, filter particulates and purify the air to provide both you and your plants with clean and fresh environment. EXTENSIVE APPLICATION: this air carbon filter measures 7″ x 11.8″ with 4″ hubbed flange; can be used to eliminate odor, pungent smell and particulates from indoor grow tent, grow room, smoking room, bathroom, kitchen, drying rooms, pet house, welding workshop, 3D printer etc; matches with inline fans, can fans, duct fans, intake fans, exhaust fans, air exchange fans, ventilation duct, air ducts, vent duct hoses, fan speed controller and other ventilation equipment. EXTRAORDINARY AIR FLOW: 1050+ IAV 190 CFM filter carbon, machine packed Australia virgin charcoal, this guarantees both compact carbon packing and effective air flowing; inner and outer mesh chamber provides 55% open area allowing increased air flow. DURABILITY & LONGER SERVICE SPAN: including washable PRE-FILTERS, which can be easily mounted around the filter with velcro seam, to extend the life of charcoal filter; made of galvanized steel that is much more durable than aluminum. HIGH PERFORMANCE: this activated carbon filter can remove 99.8% of volatiles, foul odors and air particulates; breathable clean air to promote better health. TIPS: this charcoal air filter can be used as both Intake Filter and Exhaust Filter. For instance, after a period of time use as an intake filter, then go on using it as an exhaust filter, this method will extend your carbon filter’s service life(see also picture).